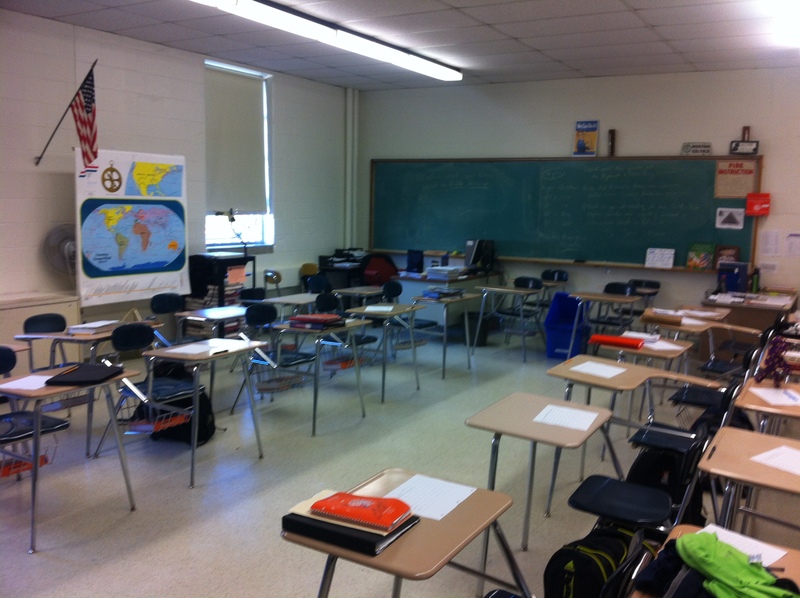 This image shows half of a classroom with students who seem very engaged. There are many different-looking students. The diversity of the students is something I anticipate in my own class. There are interesting maps and images on the wall. I love the giant map on the wall. I think it would be fun for students to personalize a map with places they’ve been or where they’re from or where historical events took place/ are occurring. It seems like a stimulating environment in which to learn. I think that the way this room is set up is nice because it’s very clean, simple, and not too distracting. I like how the desks are arranged. I think that would be a good way to have a classroom because it makes back row students less distant and allows students to see other students easily as they participate and discuss together. I could also walk around freely and be close to more of the students. The patriotic decorations are nice, but maybe a bit overboard, in my opinion. I do like the line of presidents on the wall, however. I love the windows in this class, although I would definitely want to have them open so that the room feels bright and less claustrophobic. I love the chalkboard. I would prefer a traditional chalkboard over a white board. I like how there is an electoral college calendar on the chalkboard because it encourages students to connect what they know from history to current events and discussions. 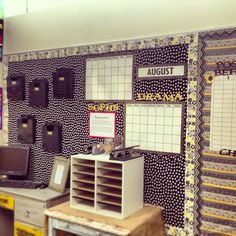 That is something I hope I can facilitate in my classroom and I think that having visual reminders of it will help both me and my students to make those connections. I like this area for helping to visually communicate deadlines, assignments, and events to students. It is also an organized way for them to turn things in and it looks very organized and functional. The classroom is an organized and inspiring environment. The desks are neatly arranged to face the center of the room (where the teacher or other presenters will walk and talk), with both sides of the room facing towards one another. The walls are covered with United States Presidents in one area and images and inspirational words of other more diverse and less-known historic Americans. 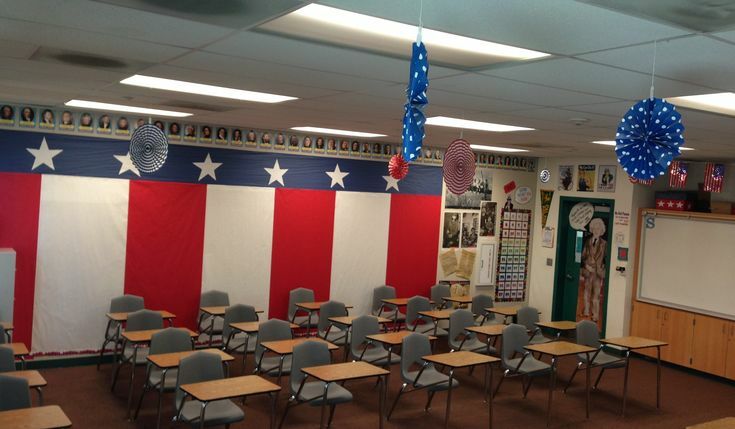 There is a large geographic (world) map that covers the entirety of one wall and a more specific map of the United States at the front of the classroom. There is an American flag and also other flags. There is a community board with various service and community-involvement opportunities within and outside of the school. There is enlightening artwork that is thought-provoking and meaningful in history.There is also an expansive pedigree chart on one wall that illustrates the interconnectiveness of humanity. There is a larger desk (teacher’s) with a computer near the center of one wall. There are many windows and they are open to let in as much natural light as possible. The students will have access to basic learning materials, as well, hopefully, technological investments provided by the school (such as iPads or laptops to do independent research and learning). Students will have their own personal journals for keeping their own personal history and recording significant learning gained in class for their personal benefit. Additionally, students will be provided with many primary source documents to allow them to read and interpret history in new and personal ways (as opposed to simply taking things at face value from textbooks and the teacher). We may occasionally use a whiteboard or chalk board for visual representations or class discussions. Ideally, there will also be an abundance of subject-related books for students to engage in individually. The students in the classroom have varied interests, backgrounds, and motives for learning. Some are well-dressed and clean. Others wear athletic gear. Others are not in trendy clothes. Some have poorer hygiene. Some appear happy, interested in others and the environment. However, some look down, seem disengaged, distressed, tired, sad, or frightened. Their emotions vary from day-to-day and moment-to-moment. Their backgrounds are both privileged and troubled. Some come from well-off homes and families; others may have familial problems even while appearing to be wealthy and happy; some may come from very dysfunctional or even abusive situations. The circumstances and backgrounds of the students will be as varied as their personalities and appearances. They will likely represent a variety of races and ethnicities; some may be foreign-born and learning English for the first time. The students will each have different perspectives based on their upbringing, culture, religion, values, and life experiences. Many of the students (whether they recognize it or not) are interested in being accepted by their peers and by adults. Some of them receive little or no praise at home and may seek it in other ways. Others may feel resigned, degraded, and hopeless. Some students may not struggle with such deep issues and may have a greater sense of self worth. They may more concerned with popularity, relationships, sports, television and pop culture, clothing, technological gadgets, or being successful in school or work. Because of this, each student will be in school (and more specifically, in my class) for a different reason. During class some students may be more inclined to talk and socialize while some may be more reclusive or attentive. Ideally, all of my students are not just looking at and listening to me, but are listening to and watching their peers, as we as a class engage in a meaningful discussion. Ideally my students have respect for the teacher and for one another, but they also have a compelling interest in the discussion or activity, so that they want to be involved and are in charge of their own learning. In my classroom, the emphasis for classroom conduct will be on principles rather than rules. For example, the guiding and overarching principles of honesty, integrity, kindness, and respect. When disciplinary problems arise, I will be able to discuss them with the student(s) in terms of these principles. This will hopefully help students to use their own best judgement and emotional empathy more than a simplistic list of “dos” and “don’ts”. It will also create less loopholes for children who seek to “get around the rules.” It is a higher law that gives credit to students’ own abilities of judgement and self-control. Classroom policies will follow patterns of routine, helping students to know that “there is time for everything.” In other words, students will gain the expectation, not of coming to a long class lecture each day, but of a dynamic, engaging class. There will be times to listen, but there will also be times to talk, have fun, and do activities. Homework policies will have clear expectations. They will usually be interpretive, dynamic learning opportunities, rather than memorization or accumulating facts. Students will be allowed two “late passes” per term which will allow them to turn in an assignment late without penalty. However, if the passes go unused by the end of the term, they can be redeemed for extra credit, an added incentive to avoid procrastination and plan ahead. A lesson I might teach would be on the importance of interpreting primary source documents in studying history. In this lesson I would hope for students to learn to think about history not as memorization and facts, but as something to think carefully and considerably about in order to form their own opinions about events and people of the past. In this way students can discuss history and appreciate it as it relates best to them. I would begin the lesson with a simple discussion of how histories are created and the inherent uncertainty involved in writing and interpreting history. We would talk about primary versus secondary sources and different types of primary sources, their pros and cons. I would share examples of some of the cautions and difficulties that may arise from working with primary sources. Examples would come from my own experience (such as interviewing early Utah settlers many years after events and trying to reconcile their stories with other established events) and from other historians (for example, historians of Ancient Egypt reading papyrus that has several unrelated layers of written text). Students will then have the opportunity to select one of several options of sources having to do with a variety of subjects (they will be able to choose according to their own interest and preference). In groups with others who have chosen to study the same source they will read, discuss, and interpret the document guided by several subjective, open-ended questions that deal with each text. They will also be encouraged to research the context of the document and discuss how the time and circumstances under which the document was made affect its meaning and how not understanding the context could lead to possible misinterpretations. We will discuss how this relates to reading and understanding history, but how context and understanding is also crucial in evaluating modern sources. As a class, each group will have the opportunity to share their interpretations. Groups with the same document that interpreted it somewhat differently will allow the class to discuss how both can be right even if they are different. The objective of this will be to help students see the study of history in a less intimidating way and to be more enthused about learning it. Hopefully they will see it as mysterious and “discoverable” and not so stagnant and permanent. This topic is fundamental to understanding history and is also fascinating and liberating. Before the lesson I would greet my students and talk a bit leading into the lesson. During this lesson, I would begin the discussion in the middle of the room by asking open-ended questions about how we make history. I would list all responses on the board, building on and expounding student ideas, and asking follow-up questions. As I share my experiences, I would move throughout the room and make eye contact with all of my students. I would try to be engaging in my mannerisms and the upbeat tone of my voice and act with energy and humor. Before telling the class to break into groups I would offer clear instructions and expectations on the assignment. After students broke into their groups and began to work more independently, instead of returning to my own desk, I would move from group to group and observe or engage in discussion or answer any questions that may arise. At the same time I would be conscious of the time and eventually call back collective attention to finish the discussion. As each group shared their interpretation, I would help the class as a whole understand how the principles relate to them. I would ask and answer questions to the best of my ability. I would always be involved with the students and spend as minimal amount of time possible with administrative or other tasks. During this lesson students are given many opportunities for active participation and learning. As students enter, they will initially be talking, texting, or working on other things. However, as the class begins, they will be interested in the conversation that bridges to the start of the class. Some students will continue to talk, but most talking will stop as I ask for attention. Some students will quickly respond to questions. Others may not respond or may take more time to formulate an answer (even when the questions are simple) if they choose to consider the questions presented to them. They will alternate listening to one another, listening to the teacher, and thinking themselves. The period of discussion (which isn’t too long) will end and students will be able to consider which document they might have the most interest in and will move to form that group. Some students may seem to not care, but others will find documents from slaves, suffragettes, civil rights activists, civil war participants, or american immigrants to be the most interesting. They will receive documents and other historical sources to understand context and will organize how to read and discuss these among their group. At this stage, they naturally have more autonomy and leadership. Some students will take the role as natural leaders, but as the teacher engages with the groups, each student will be asked for an opinion. Students will write some of their main points. At this point, again, some students may be disengaged, but knowing that they will present to the class may encourage more equal participation. Finally, students will either listen to others or tell the class about their document and its significance. I will assess students’ learning by monitoring general participation, but more so by asking students to either write or share personal opinions that changed (for example, some may “bust” their historical assumptions as they read actual source material from the time or event). I realize that not all students are fully comfortable expressing thoughts and opinions verbally in class and so I would balance that with writing, project-making, group work, and occasional simple exams. What I would emphasize the most in this work, however, is students’ ability to consider multiple viewpoints and form their own opinions based on personal research and understanding.